This is the discography of rock and roll musician Chuck Berry. Format: Double LP MONO only. Rock And Roll Music - Any Old Way You Choose It - The Complete Studio Recordings... Plus! "Thirty Days (To Come Back Home)"
b/w "Brown Eyed Handsome Man"
1957 "School Day (Ring! Ring! Goes the Bell)"
"I Got to Find My Baby"
b/w "I'm Talking About You"
1964 "Nadine (Is It You?)" b/w "The Things I Used to Do"
b/w "Welcome Back Pretty Baby"
b/w "It Hurts Me Too"
1969 "It's Too Dark in There"
1975 "Shake, Rattle and Roll"
1979 "Oh What a Thrill"
2017 "Big Boys" — — — — — — — "Chuck"
Dash denotes releases that did not chart. Not all of Berry's UK singles were released in the same year as the initial US release, and not all of his UK singles featured the same A-side and B-side configurations as in the US. Billboard did not publish a separate R&B singles chart in 1964. For this year only, R&B chart positions are from Cash Box magazine. ^ Rudolph, Dietmar. "A Collector's Guide to the Music of Chuck Berry: The Chess Era (1955-1966)". Retrieved October 3, 2010. ^ Rudolph, Dietmar. "A Collector's Guide to the Music of Chuck Berry: The Mercury Era (1966-1969)". Retrieved October 3, 2010. ^ Rudolph, Dietmar. "A Collector's Guide to the Music of Chuck Berry: The Back-at-Chess Era (1969-1975)". Retrieved October 3, 2010. ^ a b c d "Charts & Awards: Chuck Berry - Billboard Albums". Allmusic. United States: Rovi Corporation. Retrieved January 1, 2011. ^ "Chuck Berry". The Official Charts Company. Retrieved January 1, 2011. ^ a b "Gold & Platinum". RIAA. Retrieved 2019-04-09. ^ "Chuck Berry, 90, announces first album in 38 years". The Guardian. October 18, 2016. Retrieved 18 October 2016. 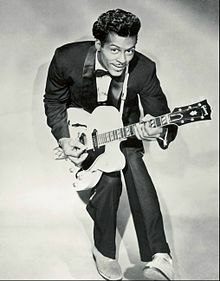 ^ "Chuck Berry". Discogs. Retrieved 2019-03-07. ^ Thompson, Gordon (2008-09-10). Please Please Me: Sixties British Pop, Inside Out. Oxford University Press, USA. ISBN 9780195333183. ^ a b "Chuck Berry: Billboard Singles". Allmusic. Rovi. Retrieved December 22, 2010. ^ Whitburn, Joel (1992). Joel Whitburn Presents the Billboard Pop Charts. Menomonie, Wisconsin: Record Research. ISBN 978-0-89820-092-8. ^ a b Whitburn, Joel (2006). The Billboard Book of Top 40 R&B and Hip-Hop Hits. Menomonie, Wisconsin: Record Research. ISBN 0-8230-8283-0. ^ "Chartverfolgung / Berry, Chuck / Single". Media Control Charts (in German). Germany: Music Line. Retrieved February 11, 2011. ^ "My Ding-A-Ling by Chuck Berry" (ASP). Single Top 100. Hung Medien. Retrieved February 11, 2011. ^ "My Ding-a-Ling by Chuck Berry" (ASP). VG-lista. Hung Medien. Retrieved February 11, 2011. ^ Roberts, David (2006). British Hit Singles & Albums (19th ed.). London: Guinness World Records. p. 55. ISBN 1-904994-10-5.